If you’re concerned about your poorly-aligned, chipped, or uneven teeth, then teeth reshaping can be a cost-effective and convenient solution to these dental issues. At Green Apple Dental Clinic, we often combine shaping or contouring teeth with a treatment known as bonding. This involves applying resin to improve the overall appearance of the teeth. The front teeth are the best candidates for reshaping and bonding, helping you to have a beautiful smile you’re proud of. When having your teeth reshaped or contoured, we will first have a dental x-ray done to check the location and amount of pulp. Our professional dentist will also gently remove the tooth enamel with a laser or drill, in preparation for the contouring stage. 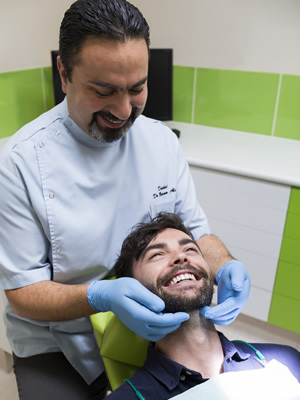 The step in this treatment involves trimming the misshapen areas, shortening excessively long teeth or altering poorly shaped teeth to even them out for optimal bite and alignment. Finally, your teeth are smoothed and polished, leaving you ready to show-off your beautiful new smile. To address concerns such as gaps and chipped teeth, as well as improve shape and colour, we combine reshaping with a method known as bonding. This process involves applying a putty-like resin to the teeth, which both adheres and hardens. This resin is coloured to either match or improve the colour of the tooth it is being applied to. Before applying the resin, the dentist will numb the area in preparation for etching. This step involves using a special dental tool to etch the surface of the tooth, which allows the resin to adhere more easily. Numbing the area prevents sensitivity, allowing our patient to have a comfortable experience that is as painless as possible. Once the resin has been applied and shaped, a light is then shone on the tooth to promote further hardening. This bonding process can last from 30 minutes to up to an hour. Teeth that have been reshaped and bonded require special aftercare to maintain their desired results. When compared to other forms of restorative dentistry, bonded teeth are more prone to discolouration or chipping when not cared for properly. That’s why it’s important patients avoid risks such as eating hard foods, biting their fingernails, chewing on hard objects (such as pens), and using their teeth to open things. Teeth reshaping is a great way to fix noticeably uneven teeth. When you perfect your smile, you can enjoy a more confident way of life. Contact us today to find out how we can help you achieve the smile of your dreams!